Erin Kelley is excited, because she’s getting married this week, but she’s also very worried about the family she hopes to raise. She and her husband-to-be have just bought a home in Oak Hills in the proposed City of St. George. But the movement to incorporate the City of St. George and start the St. George Community School System has given her hope, she said. “Finally, someone is doing something about this situation!” she said. Erin stopped at a St. George petition table at the entrance to Oak Hills. 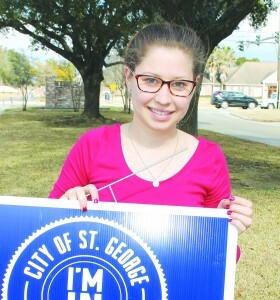 She had already signed the petition but wanted to get some pro-St. George yard signs. She said some anti-St. George signs had popped up in the neighborhood, and she wanted to “answer” them. She said she babysits for a family that sends their children to private school, where they get a good education, but that family struggles to pay $30,000 in tuition. “There’s no way we could do that,” she said. She thanked Norman Browning, who was manning the petition station, and said she would keep working on some of her neighbors who were undecided.